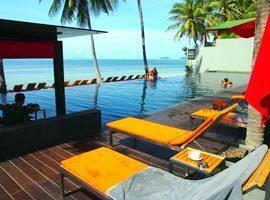 This seductive and exiting island in the Gulf of Thailand offers hotels wrapped in the most idyllic settings imaginable. Unlike many other overly commercialized destinations with a western feel, a stay in our Koh Phangan beachfront villas promises an authentic island lifestyle experience. 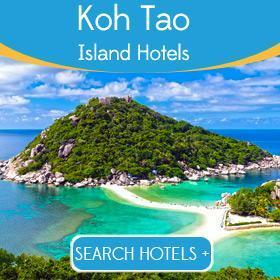 Whether you wish to stay in peaceful tranquility on spectacular Haad Yao, party on Haad Rin or shut out the rest of world in the peaceful sanctuary of the best 5 star luxury resorts with a private beach, you will find it here. Though the island's backpacker history has led to it being labeled a party destination mostly visited by a younger generation of tourists, Koh Phangan in reality retains a rural and original island character, and many tranquil ribbons of fluffy white sand where you may feel you have it all to yourself. Quaint villages feature great restaurants, shops and market stalls lining narrow lanes. Many resorts on the island are on par with the demands of discerning clientele and sports beachfront accommodation in enchanting and intimate villas at places like Anantara Rasananda, Santhiya, Panviman and Chantaramas where you can even have your own pool. Even more important is how effortlessly they blend with the exotic surroundings to keep you close to nature. 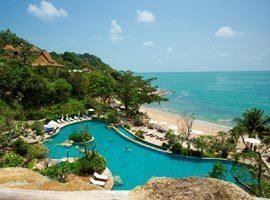 Anantara Rasananda is one of our most romantic hotels right on the beach. Its villas are discreetly located amid tropical foliage offering extra privacy and many literally have the eye searing white sands of Tong Nai Pan right outside your door. Buri Rasa offers ocean view and oceanfront rooms featuring large outdoor terraces bordered by fluffy white sand where you can enjoy a private dinner for 2, plus it has its own quaint village square complete with cafe and wine bar. Chantaramas has a secluded, but convenient location on Baan Tai Beach which means you are close to both Haadrin and Tong Sala Village. With half the premises being tropical gardens it guarantees space and utterly tranquility. Located on Haadrin Nai a stroll from the full Moon Party and near restaurants and bars of Haadrin Village while back at base tranquility prevails. 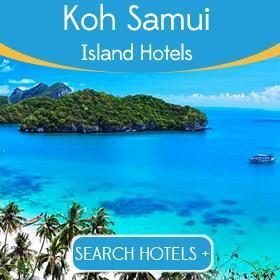 Offers pool access rooms, sea view suites and villas on the beach with their own pools. 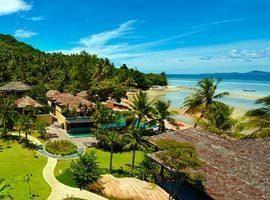 Kupu Kupu is a certificate of excellence award winner and located on the west coast featuring dramatic ocean sunsets. 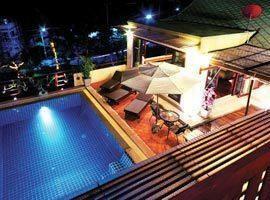 It is 15 minutes from either Haadrin or Tong Sala Village where narrow lanes are lined with restaurants. Milky Bay is a budget resort, but with an uncompromising standard and subsequent impeccable record of guest satisfaction. 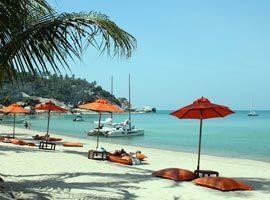 It is located on the west coast, far enough from Haadrin to feel secluded, yet near enough for convenience. Panviman Resort has a private beach on secluded Tong Nai Pan Noi on the east coast and recommended for couples on honeymoon. 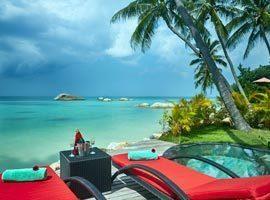 You can enjoy your massages indoors complimented by ocean views or outdoors on a private hilltop. Pariya is a cozy boutique resort located on Haad Yuan, an intimate cove bordering a placid ocean within a moments boat ride from Haadrin. 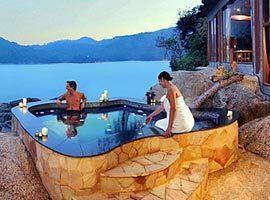 It features unique circular shaped bungalows, some are romantic with private jacuzzis. Haad Salad which translates to Pirate Beach is a tranquil cove located on the north west coast and not far from Tong Sala Village. It is a secluded location to escape the crowds and enjoy a villa with your very own personal pool. 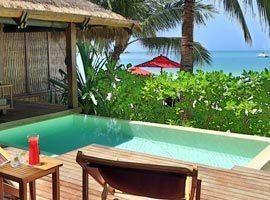 Santhiya is an Eco-luxury resort with a back to nature theme on the tranquil east coast. It is a private paradise for couples, but also accommodate families in the luxury 2 bedroom Santhiya Grand Villa Suite or Royal Grand Pool Suite. Modern and funky The Coast Resort has an outdoor lifestyle approach on Haadrin Nai Beach where it settles amid tranquility, yet is so near nightlife, restaurants, shops and other conveniences you can be there within 5 minutes. 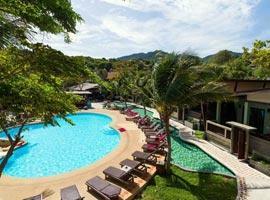 At Villa Hacienda luxury accommodation meets affordability 5 minutes from Tong sala Village. All its cozy rooms feature en-suite bathrooms and relaxing by the pool you will enjoy stunning ocean views of Koh Samui in the distance.